Glock 43 vs Shield: Which Subcompact Should I Get? Click & drag the bar to change the image! 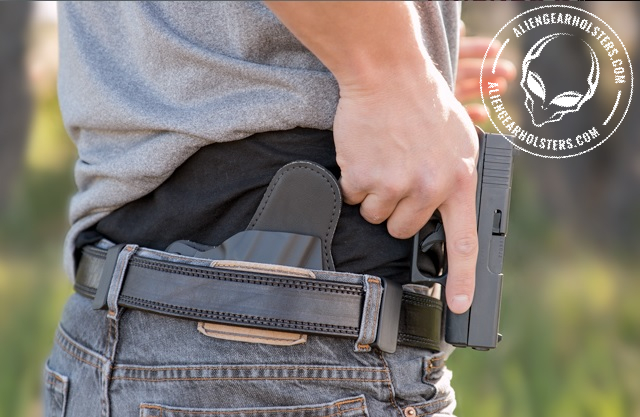 When it comes to single-stack subcompacts, the kings of the hill are the Glock 43 and the S&W Shield - leading many to weigh the benefits of the Glock 43 vs Shield for concealed carry. The truth is that there are a lot of good points to both, so it isn't like getting one is wrong and the other is right. It's more that one may be more right for you. Either is a fantastic gun to put in a concealed carry holster for daily use. The base attributes don't tell the whole story, but they certainly are worth noting when it comes to deciding the whole M&P Shield vs Glock 43 issue. Granted, they are very similar pistols in many regards but there are a number of differences. Both are slim, single-stack poly striker subcompacts. Click the image to bring up the specs! The Shield is slightly taller, at 4.6 inches compared to the 43 which stands 4.25 inches tall. However, the Shield is slightly short lengthwise, with a 3.1-inch barrel (the Glock has a 3.39-in barrel) and overall length of 6.1 inches, compared to the Glock which is 6.26 inches overall. The Shield is slightly narrower, as it's 0.95 inches wide; the Glock is 1.02 inches in width. 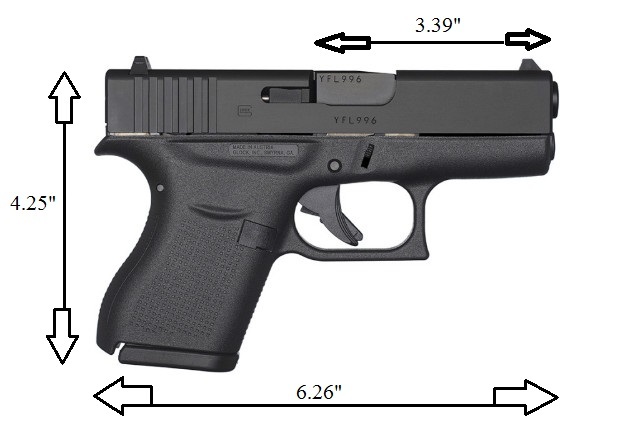 The Glock is lighter at 17.95 ounces to the Shield's 19 ounces. Both have a relatively light trigger pull with a passive trigger safety system, though the Shield takes slightly more to break with a 6.5-lb trigger pull to the Glock's 5.5 pounds. That said, the Shield can be had with an ambidextrous manual safety for those who prefer one, though the safety is quite small and may be hard to disconnect for those with larger mitts. 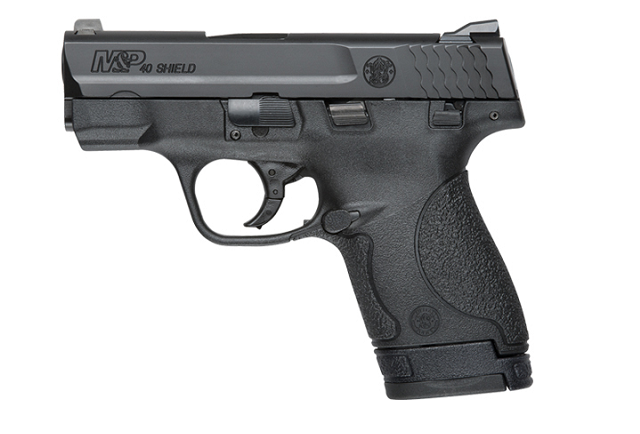 The 43 carries 6 rounds of 9x19, but the Shield - just like it's slightly larger sibling, the M&P9C, comes with a flush-fit and an extended (slightly) magazine. The flush magazine carries 7; the extended carries 8. However, there is an additional factor in the whole Glock 43 vs M&P Shield comparison, namely that of caliber. 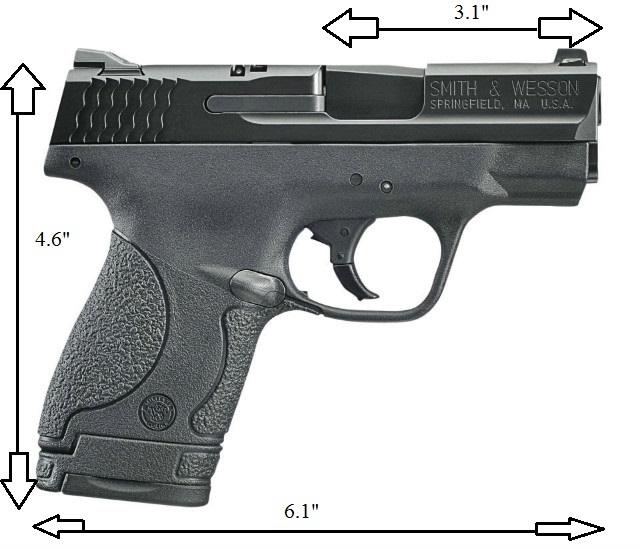 Smith and Wesson makes three calibers available in the Shield, namely 9x19, .40 S&W and .45 ACP, so you have your choice between the three dominant semi-auto handgun rounds. The .45 ACP version is slightly bigger and wider to accommodate the bigger bullet, with a 3.3-inch barrel, bringing it to 6.45 inches long and an extra 0.28 inches taller, but only swells to 20.5 ounces unloaded. 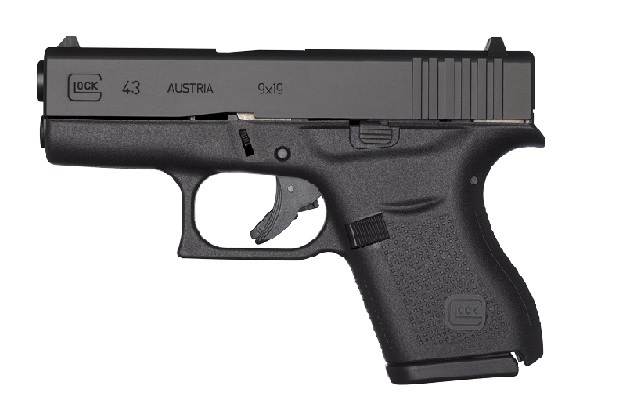 The Glock 43 is only in 9mm, though that's because of Glock's nomenclature. Glock's pistol architecture allows for multiple calibers to be made on a single chassis (not dissimilar to how carmakers come up with modular architecture that creates a sedan and crossover SUV) and they do make other single-stack subcompacts in other calibers. Smith and Wesson's nomenclature, however, is different. However, they get different model numbers. There's also the Glock 42 in .380, though it is slightly smaller still than the 43 and the Glock 36 in .45 ACP. The difference between the Glock 36 and the Glock 43 is much the same as the difference between the Shield .45 and the Shield 9; capacity is the same (6 rounds) but it's slightly wider, slightly taller and slightly longer to fit the bigger bullet. The 36 stands 4.76 inches tall, 6.96 inches long and 1.10 inches wide and weighs in at 22.42 ounces unloaded. 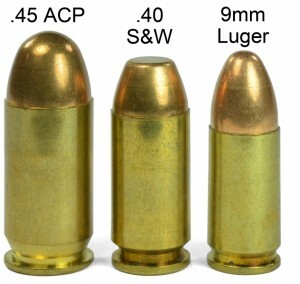 That said, the 43 is the 9mm and also the more popular mode - just as the Shield is the more popular model among S&W. When it comes to Glock 43 vs Shield...each is going to be easy to live with. Both are very easy for just about anyone to carry and conceal. Both have generous aftermarket support, including lasers, upgraded sights, extended magazines (Hive magazine extensions are well regarded) and plenty of Glock 43 holsters and Shield holsters being available. That said, there are a few bones people have picked with both of these guns. S&W's triggers are not the most highly regarded and a lot of people recommend a trigger kit for the Shield to get it dialed in. Some people have also found the 43 is a touch too small, especially shooters with larger hands. Unlike the Glock, and this is something that is important to some people, the Shield doesn't need to have the trigger pulled to take it down for cleaning and maintenance. It also can be had with a thumb safety, though not everyone prefers one on a carry pistol. Both are renowned for shooting reliably, accurately and far more comfortably than their small size would indicate, and both are rated for +P ammunition. Which CCW should you get? Ultimately it comes down to what you like in a gun. Feel and ergonomics are certainly a good thing to contemplate and this is where the Shield has the advantage. The M&P line is known for outstanding feel in the hand (the compact and full-size M&P pistols fit incredibly well) and not everyone is a fan of the aggressive rake of Glock pistols. However, some people find they take to a Glock like a duck to water, so your mileage may vary on that score. Given that these pistols are quickly becoming the Civic vs. Corolla of this handgun segment, you really couldn't go wrong with either one. CHECK OUT THE GLOCK 43 HOLSTERS! When you do head to the range, you're going to need a target...but why pay for paper targets if you don't have to? 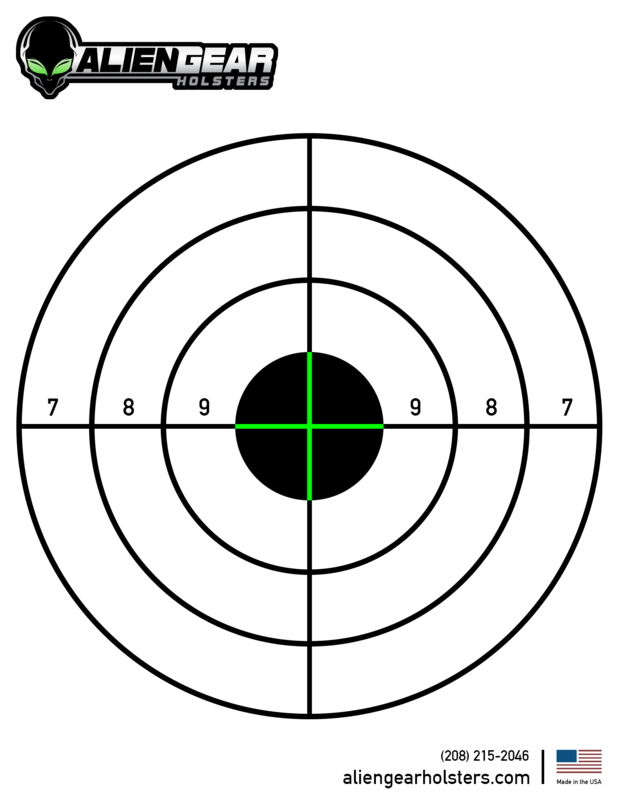 We'll give you as many as you want - you just need to download Alien Gear's printable 8.5” x 11” shooting target. Make as many copies as you like! 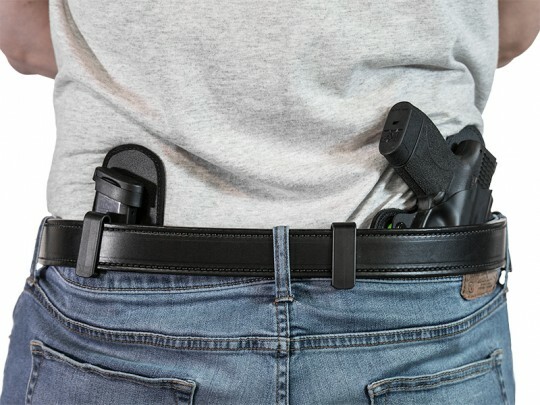 Is Single Stack Better for Concealed Carry Than Double Stack? Most things being equal, the field strip Is sooooo much easier on a Glock. I love my m and p’s but that lack of a trigger pull is replaced by the difficult to visualize yellow lever inside the pistol to keep from dong that. It really takes a tool. So iif all else is equal the Glock is much easier to diasemmeble. Although it’s not as nice to hold, I think keeping the pistol clean may be more important. In June bought a shield for 199.99 after mail in rebate, actually bought 2 one for my wife also, for less then glock 43. I've got 800 rounds through the shield I carry with zero issues, trigger took 50 rounds to come to time. Very impressed. This coming from a guy with 5 glocks. Xds 45 in 3.3 is king of the single stack for 45 for its small size in my eyes.